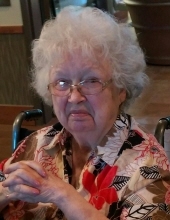 Barbara Jean (Vecera) Evans went to be with the Lord on Tuesday, November 28, 2017 in Wichita, Kansas. She was 83 years old. Barbara was born on March 9, 1934 in Billings, Oklahoma to her parents, Joe Vecera and Hazel (Austin) Vecera. She attended Billings schools where she met her husband, Earl Roland Evans. They were married on June 10, 1953 in Ark City, Kansas and had two daughters. Barbara was preceded in death by her parents and her husband, Earl. She is survived by her two daughters, Diana Hoyt of Wichita, KS and Debbie Limon of Larned, KS as well as their husbands, five grandchildren and five great-grandchildren. A funeral ceremony to remember Barbara will be held on Saturday, December 2, 2017 at 2:00 p.m. at the Trout Funeral Home Chapel in Tonkawa, Oklahoma. Barbara will be laid to rest next to her husband, Earl, at Tonkawa I.O.O.F Cemetery. Services are under the direction of Trout Funeral Home and Cremation Service of Tonkawa. To send flowers or a remembrance gift to the family of Barbara Jean Evans, please visit our Tribute Store. "Email Address" would like to share the life celebration of Barbara Jean Evans. Click on the "link" to go to share a favorite memory or leave a condolence message for the family.